Thai Air Asia seeks new partner(s)? To be on the safe side and choose an auspicious date to travel from Chiang Mai to Vientiane, the capital of Laos, I flew at the beginning of Chinese New Year with Lao Airlines. Lao Airlines connects three times a week on Tuesday, Friday and Sunday. Checking in at the Chiang Mai International Airport on Sunday, January 29, 2006, the flight was delayed for one and half hours, but then took off at 5 p.m. to reach Luang Prabang one hour later. Most of the passengers left for Luang Prabang and only a few were in transit to Vientiane. Tourism in Laos is booming with around 1.2 million tourists in 2005. 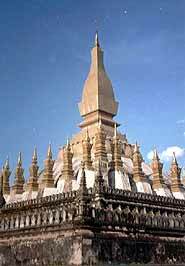 The Lao National Tourism Administration (LNTA) is even forecasting 1.3 million visitor arrivals in 2006. According to LNTA Chairman Som-phong Mongkhonvilay, the introduction of visas on arrival at 12 border locations helped to boost the tourist arrivals. In addition, the opening of a brand-new Tourist Information Center in Vien-tiane saw tourism services improving. Joining important travel trade events, such as the ASEAN Tourism Forum, International Tourism Bourse (ITB) in Berlin, Germany, the Emerald Triangle grouping of Laos, Thailand and Cambodia, and the Economic Quadrangle grouping with China, Myanmar and Thailand, the country takes important steps to increase its tourism revenue. Arriving at the modernized Wattay International Airport at 7.30 p.m. the disembarking passengers got their visa on arrival there for 30 USD and can reach their downtown destinations for a 6 USD taxi fee. Fortunately, my host Vilay Phiahouapanh, Managing Director from Lao Youth Travel had booked me at the Orchid Guesthouse next to his office, with a full view of the Mekong River. 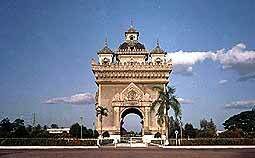 Vientiane is only a small city and you can reach most tourist attractions on foot. There are all kinds of restaurants in the new emerging “Golden Mile” along the Mekong River to taste some Lao Beer and talk about the program for the next days to come. Early Monday morning, I had to visit the Thai Royal Embassy and Consulate to ask for a 12 month Non-Immigrant Visa (multiple entries). To get this kind of visa you have to be married and pay a fee of 5,000 baht, but surprisingly you get the visa valid for one entry only that costs 2000 baht. Normally it takes two working days for issuing the visa. 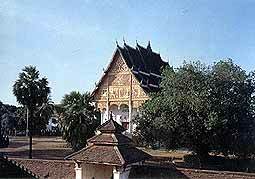 In the spare time, there is enough time to see the most important sightseeing spots in Vientiane, such as That Luang, Wat Sisaket and Wat Pha Keo. Furthermore, there was time to make the 80 km trip on Highway 13 south to Ban Phabat, where is the access road to Ban Na within the Phou Khao Khouay National Protected Area. The indisputable attraction of Ban Na is a wild elephant observation tower, but the sighting of wild elephants cannot be guaranteed. But the village of Ban Na offers home-stay accommodation and the whole “Eco” tourism project is a joint venture of LNTA and the German Development Service (DED). Back in Vientiane, I received an invitation from Thanasee-lan Krishnan, Sales and Marketing Manager of the newly built Don Chan Palace Hotel to stay there on an island in the nearly dried-out Mekong River. The five star hotel boosts a 14 storey tower and a ballroom with a capacity of 2000 people. There is a Japanese and Chinese Restaurant, but the main attraction is the nightly Hollywood movies shown on the 3rd floor, where is also a swimming pool, gym and a “karaoke” dancing bar. The return date for Chiang Mai arrived very quickly. You have to prepare 10 USD for the airport tax. It was Friday morning at 10 a.m. when the plane left Vientiane to fly to Luang Prabang first and then to arrive in Chiang Mai at 12.30. Thai AirAsia ’s CEO Tassapon Bijleveld said, the company has been searching for new partners to replace its major shareholder, Shin Corporation, after it was bought out by Singapore ’s Temasek Group. Tassapon also confirmed that the airline has only two options or two potential partners to work with. However, he declined to provide more details on the matter. “The company will do everything according to the Thai Investment law. We don’t want to be in a grey area or in any unclear situation,” he said. Under Thai law foreigners cannot hold more than 49 percent of a company and in the case of Thai AirAsia, the Civil Aviation Act comes into play adding further restrictions on foreign participation. Travel industry sources, close to the airline business, said there were no surprises in Tassapon’s statement. They believe it was clear from the outset that Temasek would have to off-load the shares in Thai AirAsia, once it bought Shin Corporation. At one point reports suggested that the airline would retain PM Thaksin’s family as the major shareholder as Temasek Group was not interested in the airline. However, the financial package that secured the sale did not differentiate between the core and subsidiary businesses owned by Shin Corporation. Speculation in the travel industry also suggested that the two parties Tassapon Bijleveld referred to in his statement could be prominent corporations such as Beer Chang and the CP Group. This could not be confirmed. However, another option could see the Thaksin family continue to play a financial role in the airline. That would require his family to buy back the Thai AirAsia shares. Considering the detailed strategy that unfolded to secure the sale of Shin Corporation to Temasek Group, the suggestion that the key players had not made provisions for Thai Air Asia to meet Thai law requirements is not very credible. Air Asia is owned by three partners. Air Asia of Malaysia held 49 percent. The airline is now public listed, although at the time of the joint venture it was owned by Tony Fernandes. Shin Corporation, which was owned by the family of Thailand ’s Prime Minister Thaksin Shinawatra, held 50 percent and Tassapon, a close ally of Tony Fernandes, held 1 percent. Nok Air is adding to its four existing flights per day for Chiang Mai routeby signing a code share agreement with Thai Airways International thereby increasing its services to the northern capital to up to 14 flights per day, making Nok Air the airline with the most flights serving the Bangkok-Chiang Mai route. “Nok Air is very pleased to be increasing its flights to Chiang Mai, with the code share agreement with Thai Airways International. This means that Nok Air’s passengers will benefit from this agreement as services will be available nearly every hour,” said Patee Sarasin, CEO of Nok Air. The code share flights offer standard benefits normally provided by Thai Airways International except for the redemption of THAI mileage collection. Passengers can reserve these flights through all the normal channels provided by Nok Air, but check-in will be at the THAI check-in counter, the code share flights will be on THAI aircraft. Nok Air travelers have the option to make reservations for their desired flights on the Nok Air website (www.nokair.com), providing them with the opportunity to choose their own seating, or they can call the Nok Air call center (1318). Payments can be made online or via the call center with a credit card, and by cash at any 7-Eleven nationwide featuring Counter Service Plus, at Siam Commercial Bank ATMs (for SCB account holders), Krung Thai Bank ATMs (for Krung Thai account holders), or at any Nok Air airport counter. Nok Air travelers can also book and pay for their flights by using mPAY solution via WAP ‘Nok Mobile Booking Service’, as well as at Tsutaya President Park, Seacon Square, or BigC Rajdamri branches. Travelers can now easily check flight information and airfares via SMS 24 hours a day 7 days a week. Simply type “Nok” and send to 4863999 (SMS costs THB 3 per message).